After 45 days of adrenaline-pumping action, the Smaaash Sky Karting ‘Catch me if you can’ tournament came to a close. This one-of-a-kind tournament for amateur go-kart tournament for adults commenced in February at the Delhi and Mumbai centres. Enthusiasts and interested participants, could walk into either of these centres, register for the tournament and clock their lap times. The competition saw more than 6,000 participants out if which some were selected for the semi-finals on 31st March. The Top 20 racers were selected for the grand finale in Gurugram. Shourya Paul took top honours in the ‘Catch me if you can’ tournament and bagged a cash price of Rs 50,000. Justin Singh was the 1st runner up and George B Jacob was the 2nd runner up for the tournament. 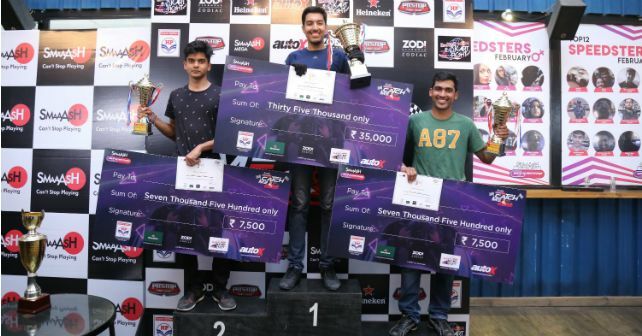 Expressing his excitement and sharing his experience at SMAAASH Sky Karting, Narain Karthikeyan, the first Indian Formula One driver said,” I am happy to see the increasing interest towards motorsports in India. Events like these are a great platform to encourage racing as a sport among youth. I wish the best for the winners, participants, and SMAAASH”. Commenting on the success of the first Sky Karting Tournament at SMAAASH, Kaizad Bajina, Chief Technical Officer, SMAAASH said, "We are thankful to Narain Karthikeyan for all his support to SMAAASH and the tournament. It is really encouraging to receive such a great response for the event at Delhi as well as Mumbai. This has motivated us to organize more such events in the future. We are glad that we are able to provide a great platform for competitive racing in India”. Events like these not only give a chance to experience the thrill and excitement of motorsport action but also help the youth discover their hidden talent.